The Burton Leonard Scarecrow Festival takes place every year over the early May Bank Holiday weekend (Saturday to Monday). Burton Leonard is a pretty Yorkshire village a few miles between Harrogate and Ripon and this is a real community event with many villagers choosing to take part. A map showing the location of all the scarecrows being displayed with a list of the themes can be picked up from the village hall in the centre of the village and then you can walk around at your own pace choosing your own route. A few stalls are set up on the village green selling second-hand books and offering tombola prizes. 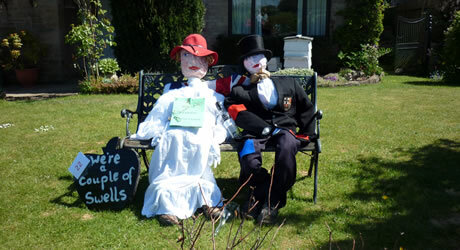 The Burton Leonard Scarecrow Festival is well worth a visit and children in particular will particularly enjoy the imaginative creations on display, whilst all visitors will appreciate the huge effort that has been put into coming up with the original ideas and then making the scarecrow displays. My favourites this year (2011) included 'His and Hers' illustrating the difference between a typical man's life (think cricket, beer, tv...) and a woman's life (think cooking, washing machine, housework...), and also the Strictly Come Dancing scarecrow display featuring Anton du Beke and Ann Widdecombe, which were very realistic. Other interesting creations included the 'All-rounder sportsperson', the Jolly Green Giant, swimmers in a pool (cleverly done) and characters from the Wind in the Willows. Look out for the Burton Leonard Scarecrow next year and go along and take a look for yourself. This entry was posted on Tuesday May 24th, 2011 at 7:30 PM and is filed under Places to Visit, Things to do.You can follow any responses to this entry through the RSS 2.0 feed. You can leave a response.